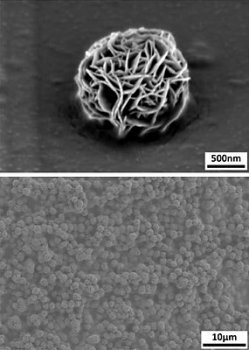 Dan Luo, professor of biological and environmental engineering, and colleagues describe their creation in the Dec. 2 issue of the journal Nature Nanotechnology. The new hydrogel is made of synthetic DNA. In addition to being the stuff genes are made of, DNA can serve as a building block for self-assembling materials. Single strands of DNA will lock onto other single stands that have complementary coding, like tiny organic Legos. By synthesizing DNA with carefully arranged complementary sections Luo's research team previously created short stands that link into shapes such as crosses or Y's, which in turn join at the ends to form meshlike structures to form the first successful all-DNA hydrogel. Trying a new approach, they mixed synthetic DNA with enzymes that cause DNA to self-replicate and to extend itself into long chains, to make a hydrogel without DNA linkages. "During this process they entangle, and the entanglement produces a 3-D network," Luo explained. But the result was not what they expected: The hydrogel they made flows like a liquid, but when placed in water returns to the shape of the container in which it was formed. "This was not by design," Luo said. Examination under an electron microscope shows that the material is made up of a mass of tiny spherical "bird's nests" of tangled DNA, about 1 micron (millionth of a meter) in diameter, further entangled to one another by longer DNA chains. It behaves something like a mass of rubber bands glued together: It has an inherent shape, but can be stretched and deformed. Exactly how this works is "still being investigated," the researchers said, but they theorize that the elastic forces holding the shape are so weak that a combination of surface tension and gravity overcomes them; the gel just sags into a loose blob. But when it is immersed in water, surface tension is nearly zero -- there's water inside and out -- and buoyancy cancels gravity. The DNA used in this work has a random sequence, and only occasional cross-linking was observed, Luo said. By designing the DNA to link in particular ways he hopes to be able to tune the properties of the new hydrogel. The research has been partially supported by the U.S. Department of Agriculture and the Department of Defense.